In February 1996 Microsoft replaced WinHelp by Compiled HTML Help with the release of Windows 98. This help system is used until today without any major overhaul and the quality is still not conclusive. Admittedly it needs some more effort to implement a really context-sensitive and efficient help system but this is what users need and expect from the leading software companies precisely because they have the knowledge, the techniques, and the creative developers to implement it. I think you all know the boring question ‘Was this information helpful?‘ within textual-based help systems. Sorry, I always have to say NO. I’m an old man and after crawling from link to link to link to link, … I sometimes forget my original question. I scan through the text like a hunter trying to spot the most relevant information that is hidden in the endless stream of sentences and paragraphs. It’s distressing and far away from being effective to follow the motto ‘Read more, learn less‘. Research tells us that we spend almost 30% of our time searching for relevant information. Of course finding relevant data is critical to our productivity but spending one third of our productive time on searches leaves not much time on the actual creative usage of our findings. We have the challenges with large data sources and so we need effective tools for search, analysis, and visualization. Concentrate on applying knowledge instead of using the precious time on inefficient searches. It’s Filter and Layout Failure. So it’s time to replace textual help by a more modern technique as people of the modern era want to be guided by pictograms and other kind of visualized information. An additional benefit of visualization is that nearly everyone keeps the information in his mind for a considerable time. Every app installed on an iPad should offer an online help. As an example I looked at the online help of the app Bento (FileMaker Inc., USA). Bento is a mobile app for managing databases. This is the usual way textual based help systems work. Make it context sensitive, read less, learn more, keep it in mind for a longer time, minimize the user actions. 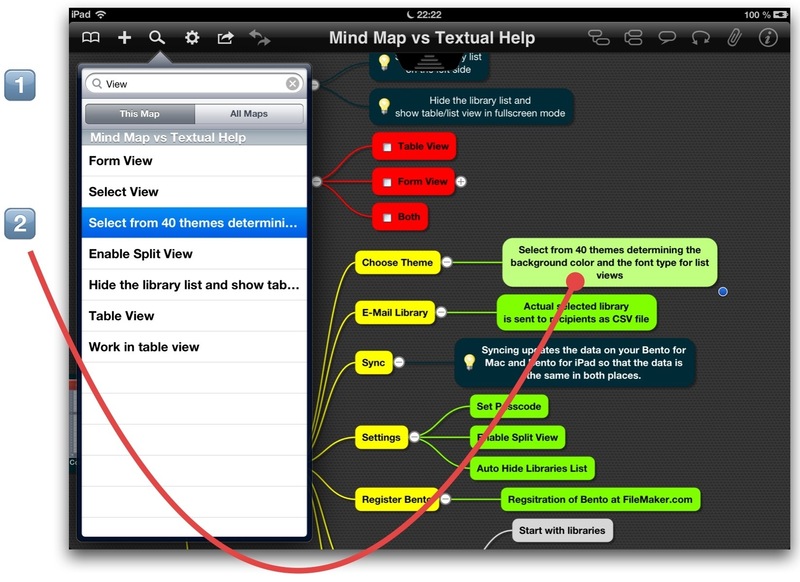 A mind map opens in a popover with the focus on the topic which describes the icon by an appropriate help text. 1 As of my limited capabilities the mind map does not contain the icons used in the app. So I trust in your imagination. 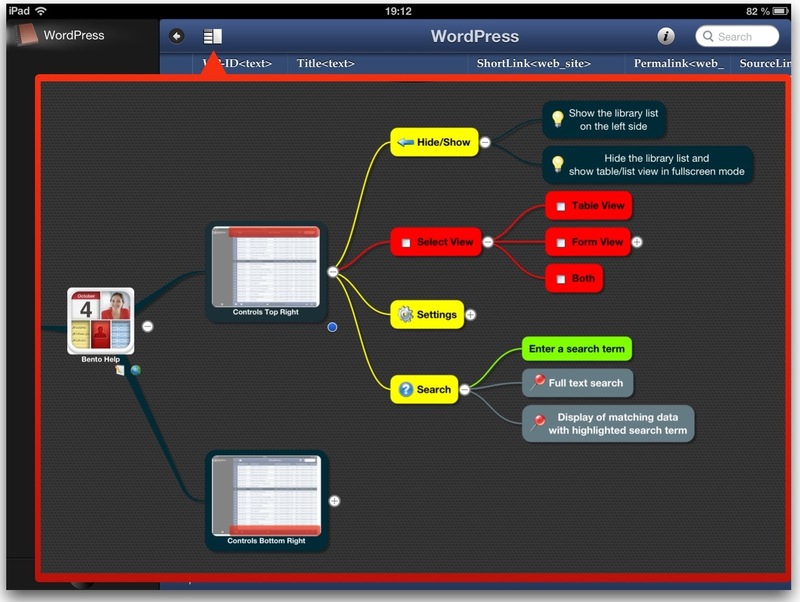 2 An app with using mind maps must have an integrated mind map viewer which is available on the market. 3 All images an icons used in the map must be identical to those used in the app to avoid any confusion. If you are not familiar with mind maps look at the topic ‘Form View’. The small ‘+’ sign is for expanding the topic to a more detailed description of sub-features. We are used to looking at information in a linear way. Mind maps show us an alternative approach to seeking information. We talked about a mind map providing context sensitive help. Other text oriented help systems are manuals. The design is standardized: a table of contents, page numbers for the details, and a large amount of written text. We all know that relevant portions of information can be gathered by reading just part of the text. That’s what many people do when reading newspapers and manuals. So it seems natural to kick off most of the text as well as the table of contents and use a well-structured mind map. Like Microsofts old-fashioned HTML help mind maps are searchable as well. Enter a search term, select from the drop-down list and the mind map expands automatically to the branch containing the term. An nice-to-have extension to this text search would be an area-by-area search, that means: all relevant topics of the map related to an umbrella term are highlighted. For example: After entering the term ‘Security’ it comes to highlighting of all topics regarding security. It’s like a guided tour for users. When asking the system directly it gives us the relevant choices. It would be a big step into future ways of absorbing information when presenting documentations as mind maps. 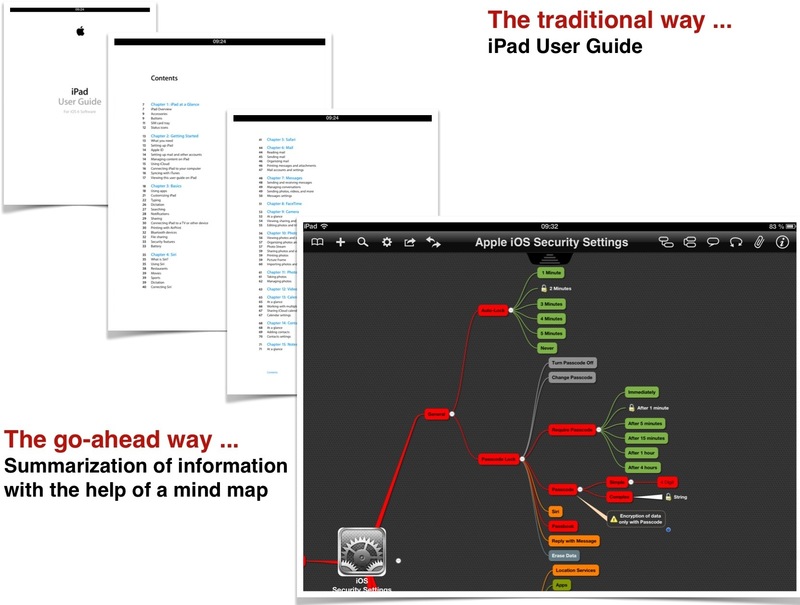 Using mind maps for a user help system may have a further benefit for developers. It’s the disclosure of inconsistencies in the UI design. See my mind map about the Security Settings of an iOS device where settings are widely spread over lots of sections in Apple’s settings app. Goto Search and enter ‘iNotes4You’ to locate the file and beyond. Thanks for flying with http://iNotes4You.com.